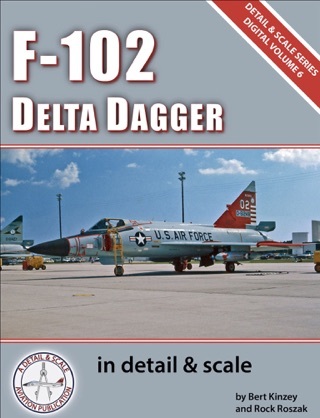 For more than thirty-five years, the Detail & Scale Series of aviation publications was considered one of the best references on military aircraft available. 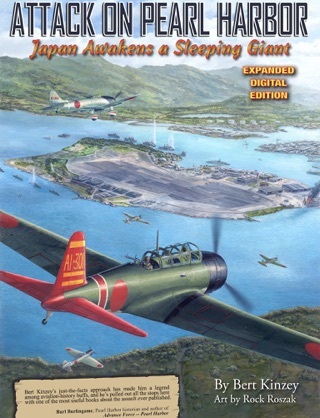 Focusing on the physical details of the aircraft, such as cockpits, engines, avionics and electronics, armament, landing gear, and more, each of the sixty-nine titles in the series provided the most detailed look at a wide variety of aircraft dating from World War II to the present. 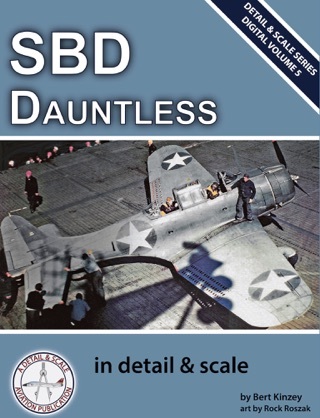 The “F3H Demon in Detail & Scale” continues the well-established and respected Detail & Scale format as the first digital title in this series. 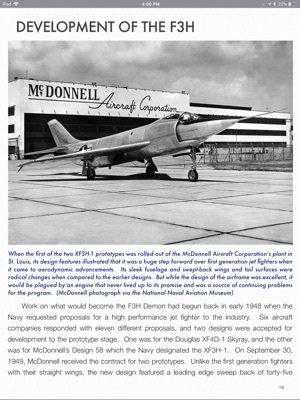 It covers McDonnell’s Demon, a jet fighter flown by the U. S. Navy in the 1950s and 1960s, in extensive detail. There are more than 340 photographs, and of these, more than 140 are photographs of details covering the Demon inside and out. All of the detail photos are in color, and almost all were taken specifically for this publication. The 340+ photographs are supplemented with more than 50 art profiles and illustrations, all of which were created just for this new title in the Detail & Scale Series. 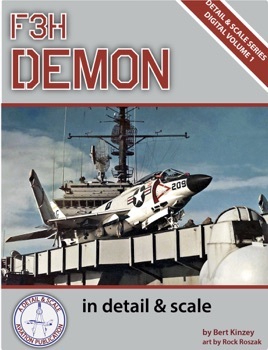 Every squadron to fly the Demon is covered along with information about their deployments aboard aircraft carriers of the Atlantic and Pacific Fleets. 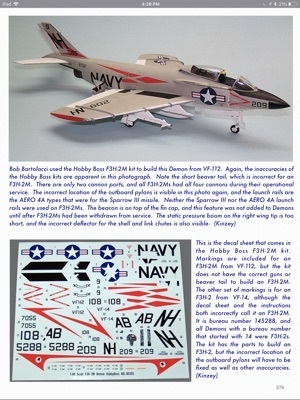 As with all books in the Detail & Scale Series, a special section is provided for scale modelers that reviews the model kits available of the Demon. 1. The ability to take notes on specific pages of the reference. This has been invaluable to me, as I have been able to jot down reminders of future actions when I have the idea, as opposed to trying to remember them. 2. The photo features and scaling are simply superb. It’s useful to be able to zoom into specific parts of a photo in order to spy out particular features of interest. All in all, a great reference guide for the Demon. filled with an enormous amount of information about the Demon, the accessibility, quality, and just simple enjoyment are matched only by the convenience and value. This is a highly recommended must-have! For a complete review go to ipmsusa.org and find the review section. Enter "Demon" as a search term and a link to the review will appear. I am looking forward to many more of these new volumes! Detail and Scale is back and better than ever! Detail and Scale is back and high-tech as well. 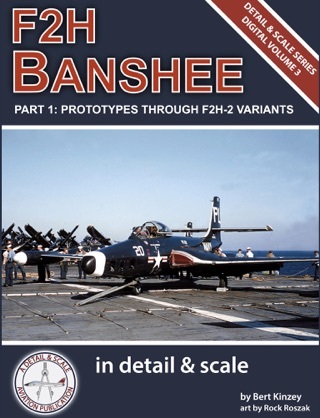 Those of us who've been modeling for a few years (decades) will have one or more of these essential titles in our libraries to help understand the differences between aircraft variants of a given subject and how to make our own models more accurate. The problem with the 'analog' references were many: the author invariably left tons of material out of the book due to limitations of page count; great reference photos were mere postage stamps in final copy; and, once a title was released, it was finished. 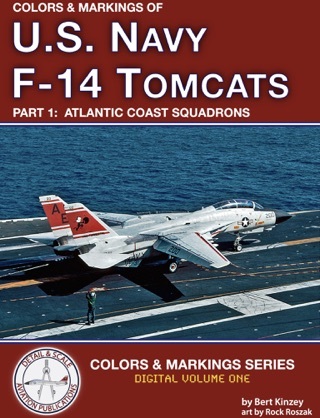 Here is the first title in this new electronic series, the F3H Demon. The title is published in iBook (iPad/iPhone) and Kindle formats using the latest in ebook authoring tools. What does that mean to you? 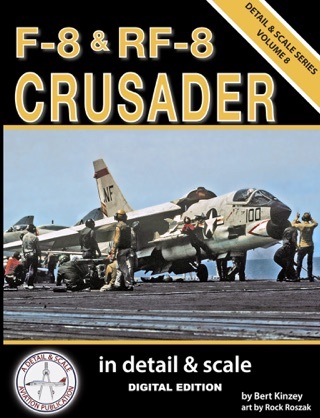 In this title, the author starts off with the history of radar and its employment with night fighters and interceptors from World War II into the 1950s. 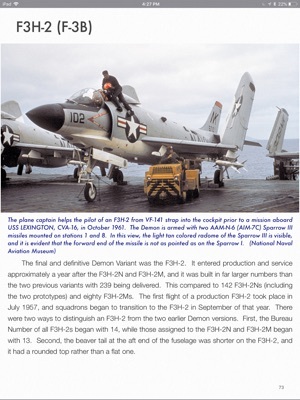 This is an essential strand of history as the F3H Demon was developed as one of the first radar-equipped fighters that could employ the first radar-guided missile - the Sparrow. Given the success of the Sparrow (eventually) and radar, the Demon's story should be rather uneventful, but such was not the case. 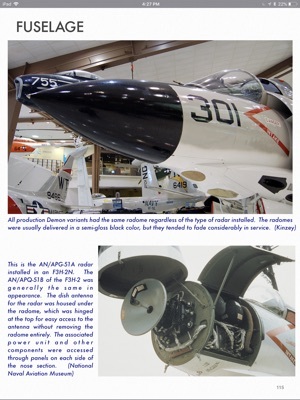 Coverage of the subject starts with the F3H-1N - while the aircraft and avionics were promising, the Westinghouse J40 engine was very unreliable leading to all F3H-1s to be grounded wherever in the world they were and never to be flown again. 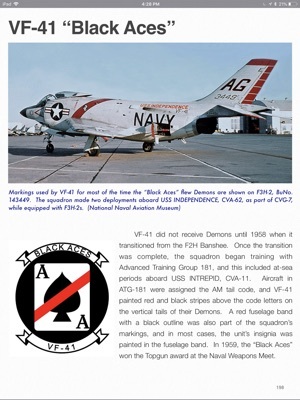 The Navy recognized the potential of the Demon and the story gets more interesting as a replacement engine is sought, so for all of you who wondered why the Demon didn't receive the J57 like most other aircraft of the day, the author provides some interesting insight. One aspect of these electronic titles that I really appreciate is that my iPad is the same size and weight no matter how many are loaded at any given time. This allows me the flexibility to access the information more interactively on the work bench and still allow me to read while on travel (waiting on flights, etc.). With all of the great information packed into this new interactive title, you're still able to purchase this at a very low price!